A Smart Card, also called Chip Card or Integrated Circuit Card is a type of pocket-sized card with embedded integrated circuits which can process data. This card can receive input which is processed by way of the ICC applications and delivered as an output. A smart card is a plastic card embedded with a computer chip that stores and transacts data between users. Smart card-enhanced systems are in use today in several key applications such as healthcare, banking, entertainment and transportation. The card data is transacted via a reader connected to a computing system. Smart cards improve the convenience and security of any transaction. The card provides tamper-proof storage of user and account identity, vital components of system security for the exchange of data throughout virtually any type of network. 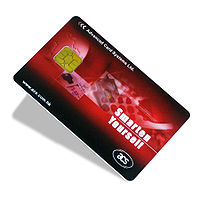 The Smart cards protect against a full range of security threats. 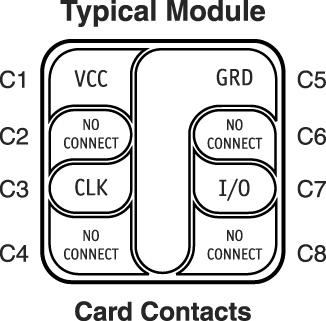 Memory cards contain only non-volatile memory storage components, while Microprocessor cards contain volatile memory and microprocessor components. The card is made of plastic, generally PVC, but sometimes ABS. The card may embed a hologram to avoid counterfeiting. The primary use of smart cards is stored value, particularly loyalty programs that track and incentivize repeat customers. Stored value is more convenient and safer than cash. In addition to information security, smart cards achieve greater physical security of services and equipment, because the card restricts access to all but the authorized user. Smart cards make it easy for consumers to securely store information and cash for purchasing. The card can carry personal account, credit and buying preference information that can be accessed with a mouse click instead of filling out forms. RST: Used itself or in combination with an internal reset control circuit. The use of the two remaining contacts will be defined in the appropriate application standards. Contact smart card readers are used as a communications medium between the smart card and a host, e.g. a computer, a point of sale terminal, or a mobile telephone. Since the chips in the financial cards are the same as those used for mobile phone Subscriber Identity Module (SIM) cards, just programmed differently and embedded in a different shaped piece of PVC, the chip manufacturers are building to the more demanding GSM/3G standards. Contactless smart card, in which the chip communicates with the card reader through RFID induction technology. These cards require only close proximity to an antenna to complete transaction. They are often used when transactions must be processed quickly or hands-free, such as on mass transit systems, where smart cards can be used without even removing them from a wallet. Cryptographic smart cards are often used for single sign-on. Most advanced smart cards include specialized cryptographic hardware that uses algorithms such as RSA and DSA.